Noriko holds Professional Diploma in Dance Studies of Laban Centre London and MA and BA in Sport Science (specialized in Dance) from Nippon Sport Science University. She starts working as an independent dance artist while she is in Cologne, Germany from 2003-2005. In 2005 Kato has been launched Dance-tect. Dance-tect is working by project bases which organized / directed by Noriko with collecting artists from dance field also artists from different art forms to collaborate. Latest work of Noriko is invited to “three colors” in Aomori for solo performance in 2016. 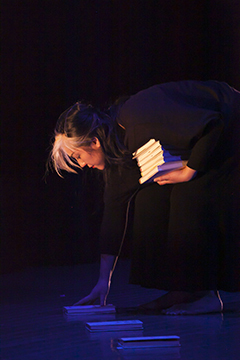 And in 2015 Noriko was special guest performer for the first Exhibition of DIALOGUES 「ひかりのまち」by Charlotte McGowan-Griffin and Hitoshi Kuriyama. In same year she participated “LABORATORY OF SILENCE” residence project in Barcelona. Copyright (C) Noriko KATO. All Rights Reserved.